Dark Matter is a mysterious phenomenon that makes up approximately 25% of all the matter in the universe. Combined with dark energy (70%), most of the universe is made up of "dark," or invisible elements. Fortunately, the effects of dark matter can be measured via its relationship with gravity, so we know it's actually there! Several space telescopes (NASA's Chandra observatory, and the Hubble and Canada-France-Hawaii telescopes) have created what is the best image to date of dark matter, and this provided the inspiration for my painting. The image is of collisions within galaxy cluster Abell 520. 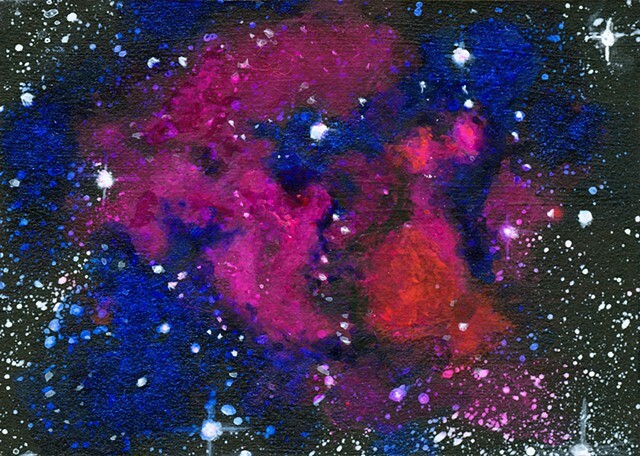 The hot gas (colored pink) was combined with areas of dark matter (colored blue) to create the dark matter portrait.